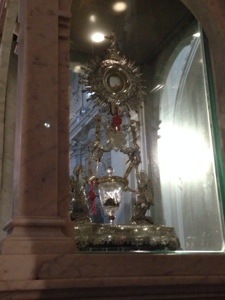 We started out the day with a wonderful Mass at Lanciano where a Eucharistic miracle happened in the 700s. We toured the museum with all the scientific evidence people enjoyed the gift shop. Then we were off to the port. It wasn’t a long drive but it was beautiful through the gorgeous landscape of Italy. We had conversion stories told on the buses along the way. I told mine on both buses and Mark Brumley shared his as well as Fr. Mark Mary who told his vocation story. 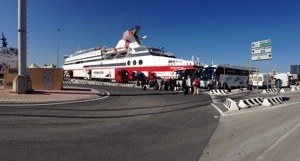 We arrived at the dock at Ancona Italy and boarded our beautiful ferry. Everyone was surprised how nice the ferry was. All is beautiful going along Italian coastline and into Greek Islands. 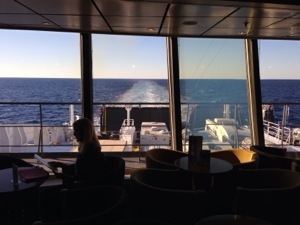 We had an hour meeting to explain procedures and also a mini “seminar at sea”. We talked about the Battle of Lepanto between the Christians and the Muslims because will be landing in Patras Greece tomorrow where the battle took place. By the way, Patras has the bones of the Apostle St. Andrew, brother of St. Peter. And it was here that the Catholic armies won the Battle of Lepanto against the Muslims by the power of the Rosary. If they had lost, you would all be speaking Arabic today!